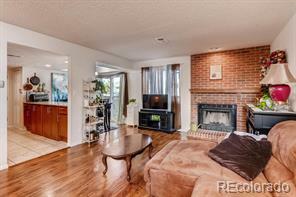 Well maintained and recently updated, 2 bedroom 2 bathroom townhome for under 230k! This beautiful home offers a spacious open floor plan totaling 1406 sq ft. With a great second floor master suite featuring an office nook, its own brick wood-burning fireplace, ceiling fan, and private bathroom. Kitchen features updated cabinets, newer appliances including high-quality Bosh dishwasher, recessed lighting, and water filtration system. This home includes matching granite countertops throughout along with laminate, tile and new carpet flooring. Home features beautiful fireplace in living room as well. Recent renovation upgrades include the furnace and water heater, windows and sliding patio door. Attached oversized garage (with newly renovated garage door) and reserved driveway parking. Private fenced backyard. Quiet and well-maintained community with a pool! Building roof has been replaced in fall of 2015. Pet-friendly community.